Smarter Sensor Modes: Light up and reserve power automatically when necessary. The intelligent sensor senses the slightest movement, lights up and dims down depending on the presence of people in the area. Larger Solar Panel: Compared to other fence style solar lights, this security light has larger solar panel configuration. Faster and more efficient to convert the sunlight into the 2000mAh battery. Lighting at whole night at 60% brightness. Home Security: Offering lights for passers-by, guests or anyone approaching your home. Perfect and cost-effective power-saving solar light for home security. 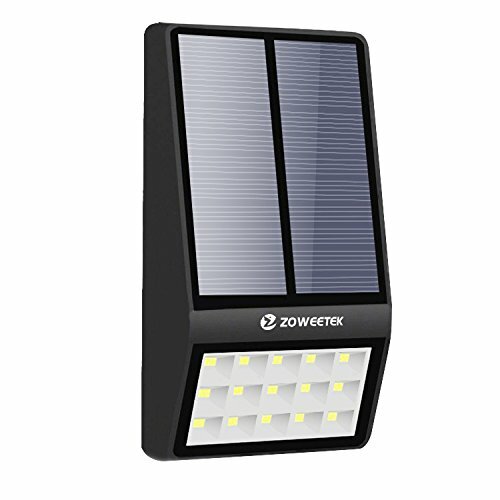 Waterproof Outdoor Light: Made of durable, weather-resistant and heatproof plastic that protect the lights from exterior damage to extend the service life of the solar panel. Great lamp for all weathers. Easy Installing: Mount the device by screws, or just hang it to anywhere you want. No batteries, No wiring and No tool require. Follow the manual for quick and hassle-free installation.